We are offering partnered funding support for projects submitted by Alberta applicants or eHealth Innovation Partners to CIHR’s Transitions in Care Team Grant competition – Stream 2: eHIPP solutions for transitions in care gaps. CIHR is offering up to $960,000 over four-years through the CIHR Transition in Care Team Grant; 30 per cent matching contributions are required to apply. We will consider providing partner funds up to a maximum of $150,000 over 4 years per successful Stream II eHIPP application led by an Alberta based Nominated Principal Applicant OR a project that involves an Alberta based eHealth Innovation Partner (as those terms are defined in CIHR’s funding call). We expect the applicant will find the remaining support (cash or in-kind) from other partners to meet the competition’s full 30 per cent matching requirement. Submission deadline: November 30, 2018 at 3:00 p.m. MST. NOTE: The Primary Applicant and the e-Health Innovation Partner must complete separate components of the application using our online application portal. If you have not previously accessed the online application portal, an account will need to be created by both the Primary Applicant and the e-Health Innovation Partner separately. Information submitted by the e-Health Innovation Partner will be held in confidence and will not be accessible by the Primary Applicant. An account on the online application portal will need to be created in order to access the application. Please only complete the e-Health Innovation Partner tab of the application; all other sections will be completed by the Primary Applicant. Impact – What is the significance of the problem to be addressed and the anticipated outcomes from the project (from both a health and economic perspective)? a. To what degree are necessary clinical end users and decision makers involved in the project to translate the results? b. Clarity provided on the technology, financial and management capacity, market assessment, competitive advantage, and post project scale up of the solution being developed. c. The economic benefit to the Province of Alberta or Canada through the commercialization of this eHealth Innovation. d. Other factors as determined by Alberta Innovates in its sole and absolute discretion. Budget – Is the budget reasonable to achieve objectives and are other sources of funding (other than CIHR) included? 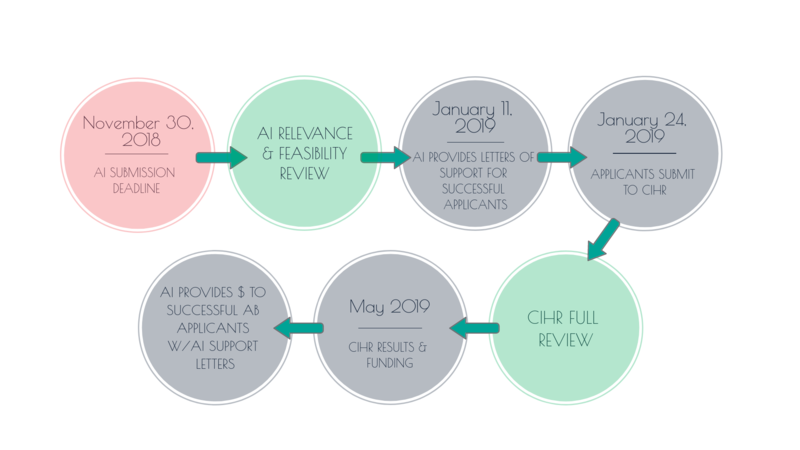 If approved, we will provide the necessary documentation to include with the full CIHR-TiC application by January 11, 2019. Applicants not familiar with innovative clinical trial methodology are encouraged to engage with the Methods Support and Development Platform within the Alberta SPOR SUPPORT Unit (AbSPORU). This platform supports the development of innovative research methods. For additional information please visit the Methods Support and Development Platform website. For further information or to submit your request for partnership support, please contact Tara McCarthy, Acting Program Manager by email at tara.mccarthy@albertainnovates.ca.